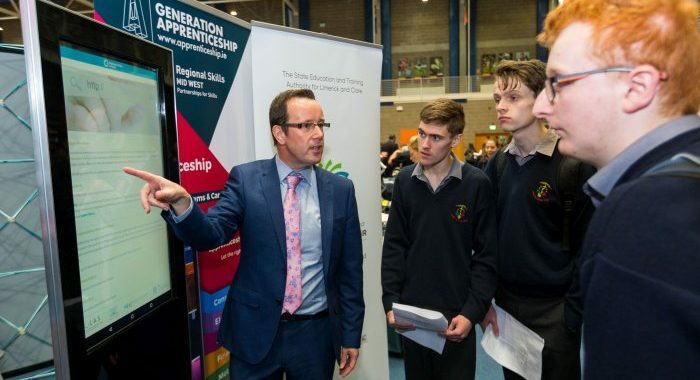 A new innovative apprenticeship app will be launched by the Mid-West Regional Skills forum in association with Limerick Clare Education and Training Board (LCETB) on Tuesday 25th September at the Institute of Guidance Counsellors post primary careers event in the University of Limerick. The purpose of the Apprenticeship App is to assist learners and students make informed decisions on their future career pathways by linking apprenticeship programmes with participating employers. The Governments Action Plan for Education seeks to double the number of apprenticeship programmes to over 60 while also increasing annual apprentice registrations to 9,000 by 2020. In addition to the traditional craft-based apprenticeships a range of new industry led programmes in sectors such as ICT, Insurance, Hospitality, Manufacturing, Aviation and Financial Services have been developed. With unemployment close to 5% in the Mid-West employers are finding it increasingly challenging to source new talent while also influencing the skills needs required to remain competitive. The app will provide those considering the work-based learning option with informative data on all participating apprenticeship employers in the Mid-West and their apprenticeship programmes across industry sectors. It will also assist guidance counsellors and parents with visibility and greater awareness of career options through the apprenticeship model of learning. Speaking at the launch Mid-West Regional Skills manager Joe Leddin stated that ‘This app will deliver clarity for learners on employer apprenticeship options while connecting employers with pipelines of talent. The challenge is to increase awareness amongst students, parents and guidance counsellors about the career opportunities available by those choosing the ‘earn and learn’ model. Very often students select Further & Higher education courses without properly informing themselves on the range of options now offered by apprenticeships. Chairperson of the Regional Skills Forum and Training Manager with LCETB, Eimear Brophy stated that ‘The Apprenticeship Council along with Education Training Boards are steering apprenticeships into new and existing sectors of the economy. Partnership is the key to successful development of apprenticeships and this collaboration with the Mid-West Regional Skills forum will enable learners and employers to access relevant information on the expanding range of apprenticeship programmes’.